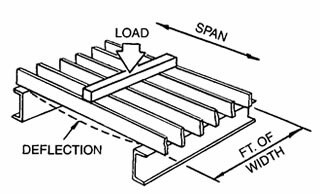 Bar Grating load tables enable the user to select the appropriate bearing bar size for the actual uniform and/or concentrated load carrying capacity and a corresponding deflection for each size/type of bar grating at a given unsupported span. 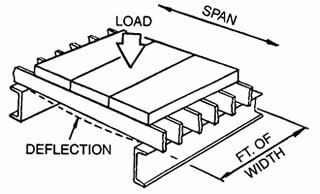 Additional details regarding Load Table Terminology & Formulas available. For 19W4 and 19W2 Brown-Campbell is pleased to provide our unique "Bar Grating Calculator" tool. For complete load table and panel width information for each of our available products please choose a link below.